On 19 October 2014, when the Orthodox Church honours the memory of the Holy Apostle Thomas who, according to the church tradition, was the first to preach the Gospel in the Celestial Empire, the 5th anniversary of the restoration and consecration of the Church of the Dormition was celebrated in the capital of China, in the territory of the Russian Embassy. The place where the church stands today used to belong to the Russian Ecclesiastical Mission in China which contributed to the development of Russia-China relations for over 250 years. On October 17, Bishop Sergiy of Solnechnogorsk, vicar of the Patriarch of Moscow and All Russia, head of the Administrative Secretariat of the Moscow Patriarchate, arrived in Beijing to take part in the celebrations upon the blessing of His Holiness Patriarch Kirill of Moscow and All Russia. Accompanying the archpastor was Mr. Dmitry Petrovsky, a staff member of the Moscow Patriarchate’s Department for External Church Relations. Mr. Yevgeny Tomikhin, Minister Counselor of the Russian Embassy in China, met Bishop Sergiy at the Beijing airport. On October 18, Bishop Sergiy, Mr. Yevgeny Tomikhin and the clergymen who had arrived in Beijing to take part in the celebrations attended the opening of an exhibition on the Contemporary History of the Church of the Dormition of the Most Holy Theotokos in Beijing. On October 19, Bishop Sergiy of Solnechnogorsk officiated at the Divine Liturgy in the Church of the Dormition. Concelebrating with the archpastor were priest Sergiy Voronin, rector of the Church of the Dormition; archpriest Andrei Stepanov, rector of the Church of the Lord’s Entry into Jerusalem in Irkutsk; archpriest Alexei Kiselevich, rector of the Orthodox community in Shanghai; archpriest Dionisy Pozdnyaev, rector of the Parish of Ss Peter and Paul in Hong Kong; and Hierodeacon Yuvenaly (Lapshin), a cleric of the Moscow Church of the Life-Giving Trinity in Ostankino. During the service, Bishop Sergiy of Solnechnogorsk presented the Patriarchal awards to those who had helped to restore the Church of the Dormition and contributed to the development of parish life in Beijing. The rector of the church, Rev. Sergiy Voronin, warmly greeted the archpastor and presented him with an Icon of the Dormition of the Most Holy Theotokos. The head of the Administrative Secretariat of the Moscow Patriarchate greeted all those present with the feast day and conveyed to them words of greeting from His Holiness Patriarch Kirill who, while the chairman of the Department for External Church Relations of the Moscow Patriarchate, had contributed to reaching an agreement on the restoration of the Church of the Dormition. After the Liturgy the hierarch visited the memorial in the territory of the Embassy, erected at the place where the Church of All Holy Martyrs used to stand. There the faithful honoured the memory of those Chinese Orthodox Christians who had died for faith during the Boxer Rebellion in 1900. On October 19, H.E. Andrei Denisov, Ambassador Extraordinary and Plenipotentiary of the Russian Federation to the People’s Republic of China, gave a reception on the occasion of the 5th anniversary of the consecration of the Church of the Dormition of the Most Holy Theotokos. Among those who attended the reception were Ambassadors of Armenia, Kazakstan, Greece, Cyprus, as well as the chargé d’affaires ad interim of Serbia in China, Ms. Tatyana Panayotovich-Tsvetkovich; Mr. Dmitry Mezentsev, Secretary General of the Shanghai Cooperation Organization; Mr. Zhang Hang Huay, head of the Europe and Central Asia Department of the Ministry of Foreign Affairs of the People’s Republic of China; Mr. Zhang Lebin, deputy chairman of the State Administration for Religious Affairs of the People’s Republic of China; Ms. Xiao Hong, deputy director of the International Department of the State Administration for Religious Affairs; diplomats of the Russian Embassy and other countries; clergy of the Russian Orthodox Church and parishioners of the Church of the Dormition; Mr. Dmitry Petrovsky, a staff member of the Moscow Patriarchate’s Department for External Church Relations; staff members of the Ministry of Foreign Affairs and the State Administration for Religious Affairs of the People’s Republic of China. During the reception, Bishop Sergiy of Solnechnogorsk presented H.E. Andrei Denisov, Ambassador Extraordinary and Plenipotentiary of the Russian Federation to the People’s Republic of China, with the Order of the Holy Right-Believing Prince Daniel of Moscow, 2nd class. On October 20, Bishop Sergiy of Solnechnogorsk departed for Moscow. The first Church of the Dormition was consecrated in the capital of China in 1723, at the place where descendants of the captive Russian Cossacks, who had defended the Albazin, used to live. The church was destroyed in 1900 during the Boxer Rebellion. In 1904, the main church of the Russian Ecclesiastical Mission in China, dedicated to all holy martyrs, was built there. It was ruined in 1957. In 2007, a memorial sign and a memorial cross were installed at that place, in the territory of the Embassy of the Russian Federation in the People’s Republic of China. At the time of the construction of the Church of All Holy Martyrs, a new Church of the Dormition, a temporary one, was built in the territory of the Mission. It happened in 1903. 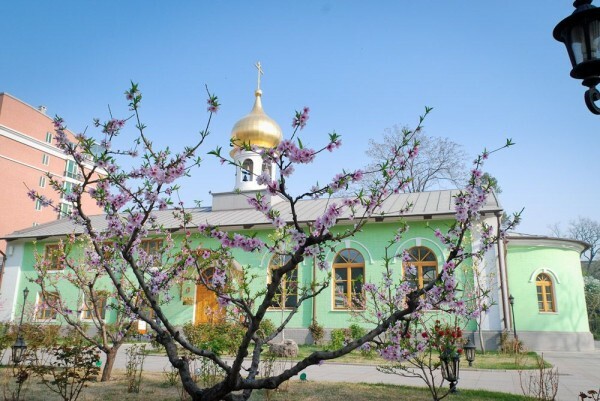 In 1954, the Mission in China was closed and its territory was used by the Embassy of the USSR which converted the Church of the Dormition into a garage in 1957. The church was restored in 2009 and, with the blessing of His Holiness Patriarch Kirill of Moscow and All Russia, consecrated by Bishop (now Archbishop) Mark of Yegorievsk on the 13th of October 2009. That same day, Mr. Vladimir Putin, then the Chairman of the Government of the Russian Federation, who had paid much attention to the restoration of the only Orthodox church in Beijing, visited the Church of the Dormition of the Most Holy Theotokos.